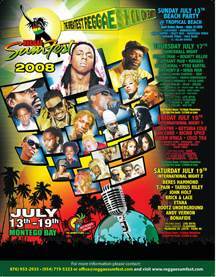 CARIBPR NEWSWIRE, NEW YORK, NY, July 7, 2008: The countdown has begun to Reggae Sumfest 2K8, which opens in Montego Bay, Jamaica with a bang on Sunday, July 13th. A number of top dancehall stars have been added to this year`s line-up, as organizers vow a return to the origins of the festival by focusing on both dancehall and roots and culture. Sumfest 2K8 will get underway with a beach party on Sunday as Classique, Crazy Neil, Danger Zone, Arif Cooper and the Pace Band gear up to bring the rhythm to beach goers. Sumfest will continue on July 17th as dance hall stars Beenie Man, Spice, Elephant Man, Bounty Killer, Voice Mail, Macka Diamond, Vybz Kartel, Harry Toddler, Busy Signal, Munga Honourable, Ninja Man, Busy Signal, Wayne Marshall, Assassin, Mavado, D’Angel, Konshens & Alley Cat turn the temperature up on the world`s greatest reggae festival. Sumfest`s international appeal takes over on Friday, July 18th when Rapper Lil Wayne joins R&B singer, Keyshia Cole, known for hits like `Should A Let You Go,` `Heaven Sent` and `I Remember,` at International night. They are set to share the stage with reggae`s conscious voices, Richie Spice, Coco Tea, Queen Ifrica, Lutan Fyah and the almost soulful, Terry Linen. The curtains of Reggae Sumfest will come down on Saturday, July 19, as the legendary John Holt, reggae crooner Beres Hammond and T-Pain, get ready to thrill fans alongside Tarrus Riley, Rootz Underground and Etana. Tickets for Reggae Sumfest range between $15 and $50 and can be obtained at: http://www.reggaesumfest.com/index.php? option=com_content&view=category&layout=blog&id= 117&Itemid=89. Fans will also be in for a treat this year as dancehall night will be streamed lived by Karib Links. Reggae Sumfest is by far the most successful event on the entertainment calendar in Jamaica and recently earned ‘Promoter of the Year’ and ‘Concert of the Year’ at the 27th Annual International Reggae and World Music Awards on May 4. For travel packages and more information, log on to www.reggaesumfest.com. This year’s sponsors include Air Jamaica, the Jamaica Tourist Board, Digicel, Ocean Spray and Jamrock Magazine.